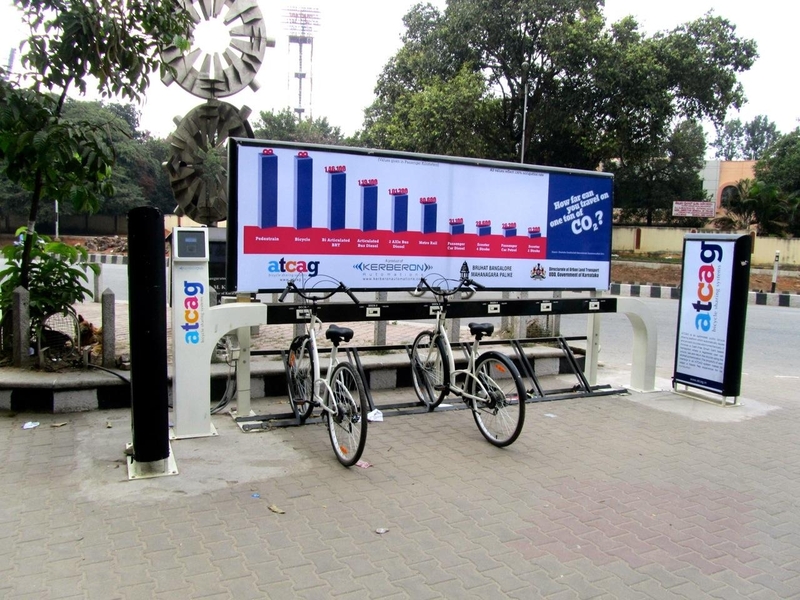 Bike-sharing in India is on the verge of exploding in terms of the number of cities looking towards implementation. Both for-profit and governmental bodies are reviewing models that could work. I was privileged to be invited to India in November 2011 by the Institute for Transportation and Development Policy to work on bike-sharing –- both at the national level, as part of a team creating a policy document for national funding, as well as at the municipal level with various cities. What I experienced was reminiscent of the China I experienced when working there in 2008. The concerns for safety and the image of cycling being only for the poor are probably the largest concerns for India right now. Similar concerns have been echoed globally by sceptics, but it’s important for India to go down the same path as other societies have, and to build a model that will work in the Indian context. While various attempts at bike-sharing have been made, most lack the basic concept and confuse it with bicycle rental. Also lacking is the technology that makes 3rd generation (high tech) systems a success and the coverage area to account for anything more than a small pilot project. But the lack of existing systems did not deter the Urban Mobility India Conference in Delhi from holding a session on bike-sharing which was well attended with quite vocally opinionated stances on whether bike-sharing is needed and how it would succeed in India. But the wheels are turning. Cycle Chalao has won a tender in the City of Pune to put a pretty decent-sized system in place. While the contract lacks two key components of successful bike-sharing systems globally, stipulation of full automation and payment according to service levels, it does allow leeway for a robust system to be installed and showcase bike-sharing’s potential in a large Indian city. South of Pune, Kerberon Automations has set up shop in Bangalore with a few stations in what looks like the beginnings of a well-designed 3rd generation system using an advertising-based business model. India is at the tipping point. If bike-sharing is planned and implemented well in the first few cities who truly adopt it on a grand scale, there is little reason why it would not take off. Indian cycling is historically a poor man’s way to travel, but a new emerging higher-class recreational cycling effort happening presently in many cities can give cycling the image facelift it needs to become an acceptable way to travel for all. It is up to local governments to educate themselves on best practices of bike-sharing globally and to apply them to the Indian context. Through our discussions with local manufacturers, we found there was interest and ability to design and supply the ideal bicycles, stations, terminals, docks, and technology needed to make bike-sharing a success. Putting the package together in India seems very plausible. What's going on with bike-sharing in your part of the world? 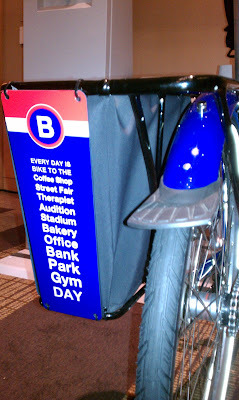 Be a guest blogger on The Bike-sharing Blog. Contact us with more info. • Hear the experiences from leading bike-sharing programs around the country. • Learn about bike-sharing emerging best practices. • Help identify how bike-sharing can better integrate and coordinate with local transit operators. • Better understand which business model is right for their jurisdiction and what are the key factors to consider before implementation. • Identify the political, social, and community factors to be considered for bike-sharing to succeed. • Share concerns about the capital and funding requirements, operational challenges, and data management needs for bike-sharing. The event, although not widely publicized, drew 90 bike-sharing professionals from around the country, many of whom were in town for the National Bike Summit as well. Personally, I found the event to be quite good as it was an opportunity for folks from around the country to finally get together at one location and share their array of experiences in this nascent field. I met folks from other existing bike-sharing services, such as Denver and Minneapolis, and those who are months or a year away from realizing their own service. With transit operations being a fast-paced world, taking a breath to stop and learn from others about their best practices is always nice. 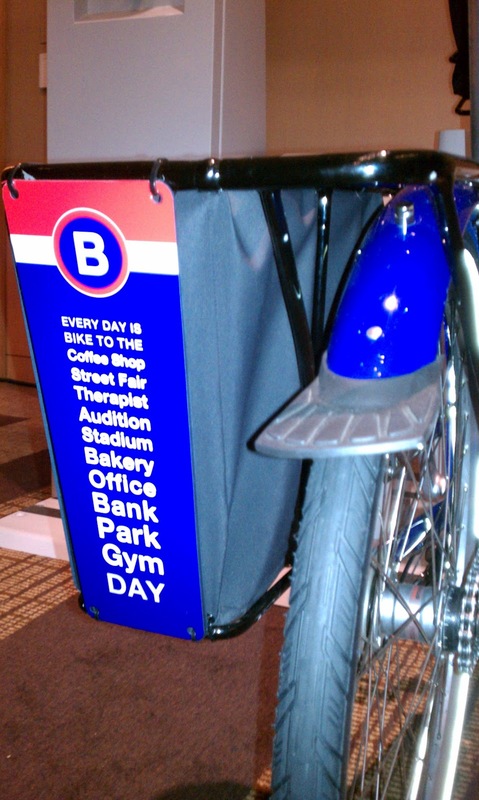 In addition, the new B-cycle station was there and had bikes with built-in rear panniers. Very cool. Russell and I at The Bike-sharing Blog look forward to working with NACTO to make more materials available to bike-sharing professionals around the U.S. and the world, to further sharing of documents, experiences, and learning for all to benefit. NACTO's future bike-share site is not yet live, but should be a good resource. Additional coordinating partners included the Federal Transit Administration, Federal Highway Administration, American Public Transportation Association, League of American Bicyclists, National Center for Transit Research, and National Bus Rapid Transit Institute. Posted by Paul DeMaio at 11:21 AM No comments: Labels: bike-share, bikeshare, conference, NACTO, U.S.
Alta Bicycle Share reaches new heights today with its selection as the vendor for the Chicago bike-sharing 3,000 bike - 300 station system planned for this summer. With Chicago, Alta will garner management operations for the largest bike-sharing systems in the US: New York City and Washington, DC. Both New York and Chicago seem to be working on the same deployment schedule. It will an interesting race to see which city is first to make bike-sharing sizzle this summer! According to The Chicago Tribune & The Mayor's Press Release, the expected cost for the Chicago program is $21 million. Most of the money is coming from the US government in the form of grants with only $3 million coming from the City. The Chicago bike-share plan calls for an expansion in 2014 to 5,000 bikes in 500 stations. Londoners woke up this morning to a newly expanded Barclays Cycle Hire. 2300 new bikes in 200 new stations mostly on the east side of the city. These new stations had been scheduled for 2012 since the launch of the system in July 2010, but it was impressive that new bikes were put out and the stations turned on over night. In other London news, according to the Daily Beast, Queen Elisabeth was diplomatic about her thoughts on the Boris Bikes. At an event with Mayor Boris Johnson, the Queen said, "At least I didn’t have to come down here on one of your bikes, The mayor responded,"Oh gosh, don’t you like my bikes?" Then she said,"Oh yes, I think they’re lovely. In fact I notice the bike racks are often empty!" Well at least the system is being used enough for the Queen to notice. Good work London! It's official, the China Low Carbon Science and Technology Museum will acquire the now retired bike #1 of the Hangzhou Public Bicycle Transport Development Service. The bike went into service on May 1, 2008 and was used nearly 7,000 times. It is one of the original 2,800 bikes removed from service at the end of last year and replaced with newer ones. The actual serial number on the bike is the six digit #800-001, the 8 meaning 2008. The new bikes now have seven digit numbers. As Hangzhou retires its first bike-share bikes, Beijing is about to deploy its first municipal bike-sharing service. 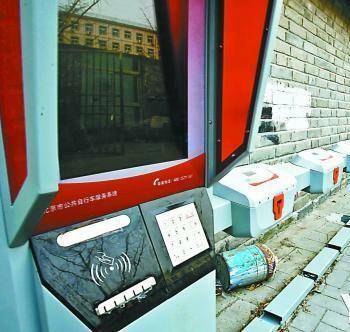 Beijing bike sharing system stations are spotted being installed in the Dongcheng and Chaoyang Districts of Central Beijing. Unlike the terminated private company bike-share system of the 2008 Beijing Olympics, this service will be owned by the city. They plan to have 20,000 bicycles in 1,000 stations by the end of this year and 50,000 bicycles by 2015, according to the Beijing Radio Network. The launch date has not been set.